They highlight the fact that the temperature hasn’t risen as expected according to the increase of radiative forcing in the atmosphere (Fig. 2). Among the different explanations, they stress the role of the deep ocean as a heat reservoir, as well as the necessity to augment the observations in the deep ocean. 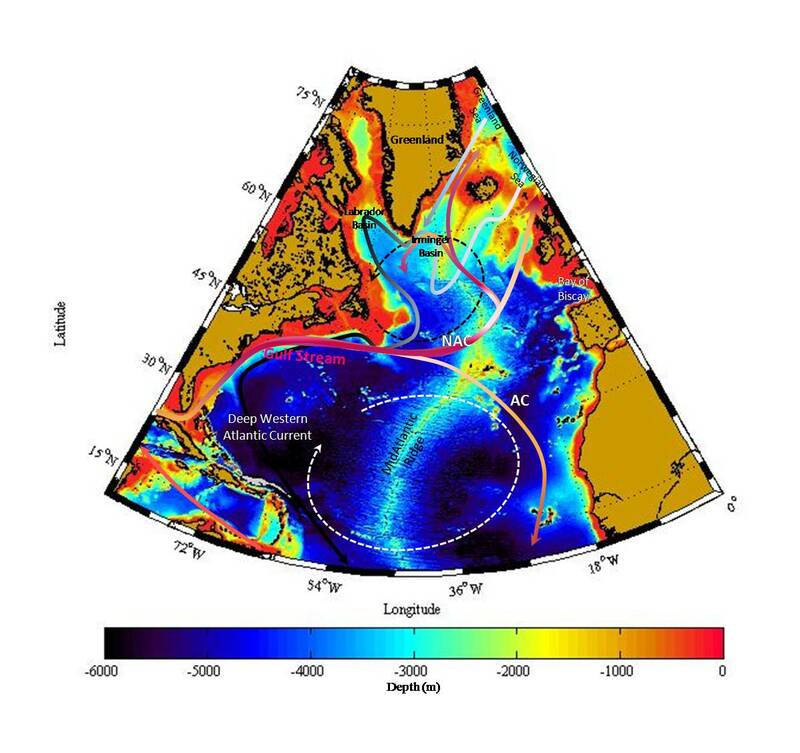 Although surprising, there are few measurements of the deep ocean that can help to find out whether that is the case (the heat is being stored in the deep ocean) or not. Fig. 2. 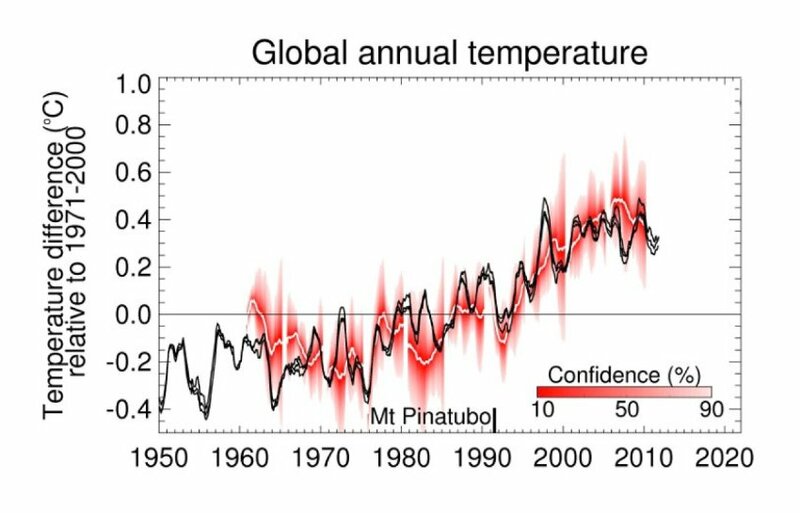 Global Temperature temporal evolution (black line). As observed, the temperature increase initiated at the beginning of the 70s stopped in the last decade. The eruption of the Pinatubo is indicated en the time axes because it released sulfur to the atmosphere, cooling the atmosphere during two years. Source : Met Office. They wonder how is possible that the transfer of heat that was predicted to be accumulating in the upper layers to the deep ocean hasn’t been observed? Is that a continuous process and that occurs allover the ocean? Or it’s on the contrary, an episodic phenomenon restricted to a few areas, as high latitudes where deep water formation takes place, and so areas where exists a direct connection between the atmosphere and the deep ocean? Warmand saline events embedded in the meridional circulation of the northern NorthAtlantic. Häkkinen et al., JGR (2011). Atlantic water in the Faroe area: sources andvariability. Larsen et al., ICES JMS (2012). They talked (the two first articles) about the transport of warm and salty waters from mid-latitudes in the North Atlantic (30-45°N) to the subpolar gyre (you have both areas in the map below) and farther North towards the Greenland and Norwegian seas or the Arctic Ocean, and how these anomalies can affect the deep water formation in the subpolar gyre and so the heat injection and storage injecting (third article). The last two talk about the relation between the sea-ice retreat in the Arctic Ocean and extreme atmospheric events as heat or cold waves, droughts, etc. at mid-latitudes in the North Atlantic through changes in the troposphere circulation. Basins and currents in the North Atlantic. The subpolar and subtropical gyre are also shown by the black and white dash arrows, respectively. Source: Raquel Somavilla. The abstract ‘A downwards heat and salt injection mechanism linking mid-latitudes and Polar Regions in the North Atlantic’ for the Conference ‘IAPSO: North Atlantic and Climate Change’ has been accepted for oral presentation. I hope to receive a lot of feedback from the presentation to complete and improve the work, but I will have to wait until July... too long?